FAMS Eighth Graders Explore Future Career Opportunities - Opportunities, Inc.
On December 11, over 100 Fort Atkinson Middle School students explored local businesses including Opportunities, Inc, Wisconsin Packaging, and Madison Area Technical College (MATC) as part of the students Careers class. The students split up into three groups and traveled around to the businesses to learn about the variety of jobs and education involved for future careers. At Opportunities, Inc. the students gained knowledge on potential careers in human resources, public relations, marketing, manufacturing, vocational rehabilitation, and safety. The eighth graders learned the education and training needed for the jobs. They took part in a small assembly project and worked together to complete a press release highlighting the day’s events. Wisconsin Packaging included a plant tour and explored the ink department, as well as the package design and customer service areas. The students were able to see how the boxes are created to fulfill their customer’s orders. At the end of the tour the students were given a small box to assemble and take home. Like Opportunities, Inc., Wisconsin Packaging stressed the importance of safety and protection at work. The eighth graders learned about the different programs offered at MATC such as the nursing, welding/fabrication, and business programs. They were able to interact with life-like nursing skills manikins by checking their pulse, blood pressure and other medical tests. The students observed the mechanics of welding/fabrications and learned the opportunities available in that industry. All three businesses spoke on the aspects of what they are looking for in their employees and emphasized the impact of having good attendance in the workplace. Each place had staff members reflect on their work history and how they got to where they are today. “I learned that having a positive attitude and great work ethic will give me more opportunities at work,” said Ashley Hannam, FAMS student. The eighth graders had a great time visiting each location to see firsthand what the company was about and what jobs were involved. “We visited facilities that we were not aware of before. It was a good experience,” Autumn Congdon noted. “At MATC, I didn’t realize they used so many interactive technologies for nursing students,” Aly Meacham stated. Another student commented, “I was surprised to find out that a college degree wasn’t necessary for many of the jobs,” Tori Gerrits, FAMS student. The Fort Atkinson Middle School Careers Day was organized by Tasha Baker, FAMS teacher, and the Fort Atkinson Chamber of Commerce, along with staff members of the participating businesses. 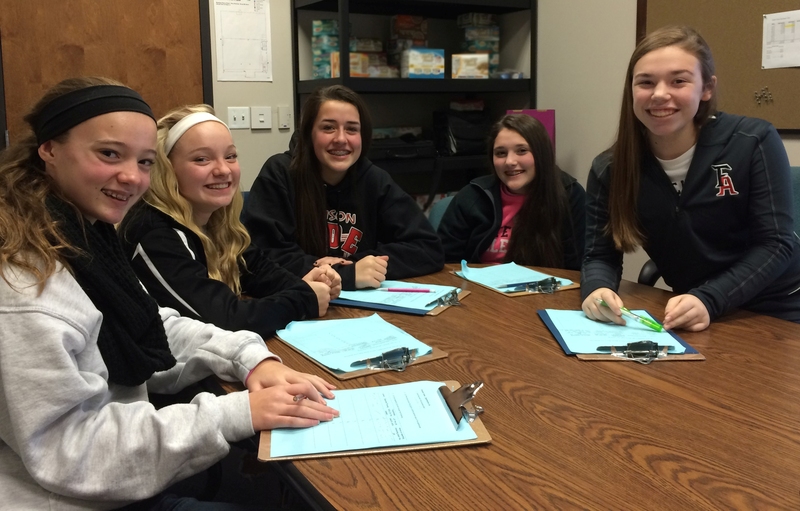 FAMS students (from left): Aly Meacham, Mackenzie Kramer, Olivia Kees, Faith Johnson, and Maggie Opperman working on the press release at Opportunities, Inc.
Armando Contreras assembling a box at Wisconsin Packaging. Elijah Gilson checking the pulse of a manikin at MATC.